- A radio playing behind the counter for staff in a shop is quite different to an installation where loudspeakers are deliberately placed in the public area. Curiously, the BBC programme Listen While You Work actually encouraged thousands of factory workers to listen to music radio. Radio stations in Britain already pay substantial amounts to play the music you hear. Fees are reportedly 12 times higher than in the USA, 6 times those in Australia. Seemingly, copyright bodies are trying to change the meaning of 'public performance' but this has yet to be tested in the courts. The issue was examined in Front Row on BBC Radio 4 on 7 January 2009, here (13 minutes, MP3, 2.3MB). A 'lack of transparency and clarity' had been described in Parliament, along with threatening letters and 'very aggressive phone calls', in Hansard, here. Several organisations are concerned, including the British Chambers of Commerce and the Federation Of Small Businesses, who have described campaigning ''to raise awareness of the antics of the PRS' and 'appalling treatment'. Supposedly, half a million businesses across the UK are playing music 'illegally', here. You could contact your own trade body. The RadioCentre's Andrew Harrison told a Parliament Culture, Media and Sport Select Committee 'It is incredibly unfair that there is in effect double taxation on the consumers of our product that they are then obliged to pay for having the radio on in the workplace... a transparent example of iniquitous double taxation', Q294 here. There is more on this in Are PRS Biting The Hand That Feeds Them?, here. Number 10 became involved following a petition to the Prime Minister 'to arrange for the clarification of The Copyright, Designs and Patent Act with regards to the listening of radios', quoting radio's use by 'Government and Local Authorities to discharge... their "Duty to inform the Public" under the Civil Contingencies Act 2004', here. 'They're saying that if you play music in a workplace it's a public performance, but the term 'public' isn't defined in the 1988 Copyright Act which the PRS is quoting. The PRS are only interpreting the law to suit them, but they're presenting this as fact' - from The Sound of Silence?, here. All Shook Up: Small Traders Hit By Music Snoops in the Sunday Times looks at the subject, including music for dogs in kennels, here. 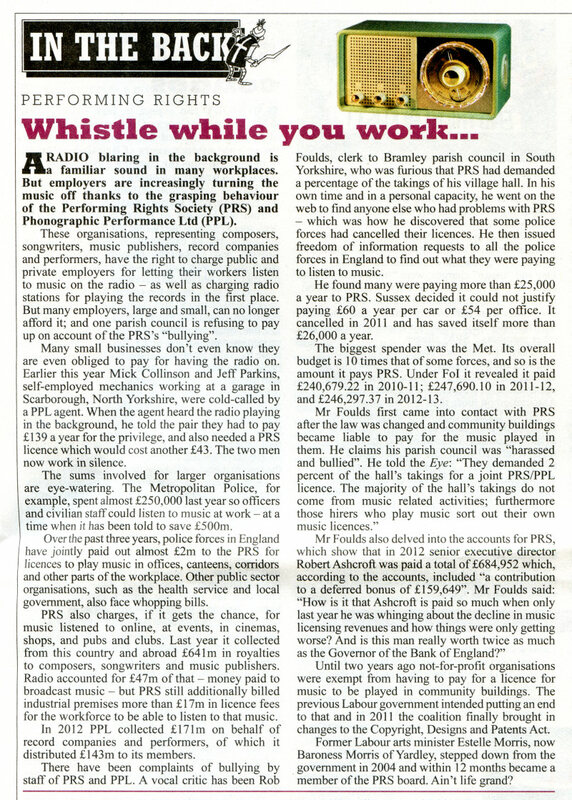 'A licence should only be required if customers can hear the music being played' says the Forum of Private Business about music in the workplace, in April 2012, here. 'Customers probably aren't patronizing this business because of the music played, are they?' questions entertainment attorney Gordon Firemark describing the situation, here. If you have paid charges which are not covered by a provision in the Copyright, Designs and Patents Act 1988, you may be able to claim a refund. In March 2012, the joint BBC and independent 'UK radio in one place' project, Radioplayer, created this Listen At Work campaign. Listen: Version 1, Version 2, Version 3. On 27 August 3013, Whistle While You Work in Private Eye examined the logic of double charging and the £47m collected from radio broadcasters, here.